Unique exterior enhancements include Autobiography-style front and rear bumpers, 19" split seven-spoke wheels, black grille mesh and special XJ50 badges on the boot lid and fender side vents. Four colour choices include Rosello Red, Loire Blue, Santorini Black and Fuji White. The cabin features an anniversary logo embossed in the centre armrest and a commemorative plaque in the walnut veneer which wraps around the base of the windscreen, mimicking the form of classic wooden-hulled powerboats. Branded treadplates in the front door sills illuminate with XJ50 logos while shift paddles and pedals are finished in bright metal. 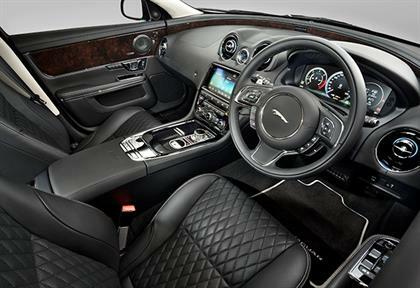 Seats are swathed in soft-grain diamond-quilted leather with Jaguar Leapers embossed in the headrests, and the front row features 18-way electric adjustment and five massage programmes as standard. The XJ50 is sold in South Africa in both standard and long wheelbase guises, and power comes exclusively from a 221kW 3.0-litre V6 turbodiesel engine. Other standard features include self-leveling rear air suspension, LED headlights with Adaptive Lighting and soft close doors among many others. "The Jaguar XJ story is one of design, desirability and performance and over the past 50 years it has become a true giant in the automotive world and it’s only right that we pay homage to it in this special way," says Ian Callum, Jaguar Director of Design. "When I started at Jaguar, the XJ was already an icon of car design, so to have been part of this story that has been told over half a century has been an absolute privilege," he added. Innovating since its arrival, the XJ has epitomised the forward-thinking approach that has set Jaguar’s luxury sedan apart over the past 50 years. Four years into its life it became the world’s only mass-produced 12-cylinder four-door car and, with a top speed of 225km/h, it was also the fastest four-seater of its time. For half a century the XJ has been the preferred vehicle to transport politicians, business leaders, royalty and even rock stars.